Rise of the Eldrazi is the third set in the Zendikar block, yet introduces entirely new themes and mechanics to reflect the devastation that has been wrought by the world eating Eldrazi. The set features 248 black bordered cards, including randomly inserted premium versions of all cards in the set. The set introduces new mechanics including: Annihilator, Rebound, Totem Armor, Level Up, Colorless Eldrazi creatures and spells. 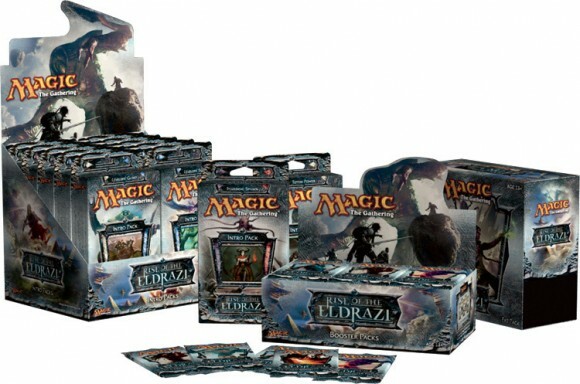 Rise of the Eldrazi limited play (drafting and sealed) is meant to be played with only Rise of the Eldrazi product. This is the set of cards I started my son on at 8 years old… so it holds a special place in my heart. It was actually a great set to start with, because it is fairly straightforward. The Eldrazi are brutal creatures, providing a more obvious tactical strategy of “get big cards and crush Dad!” There are fewer new combinations or rules in this set, so some gamers were a little disappointed. However, now that it is out of date and the prices are dropping, I’d recommend these cards as a good introduction to MtG. Get a used set on Ebay… it’s what I do now. My son loves it! 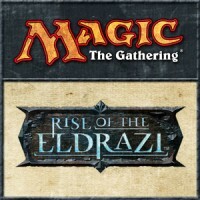 Add a Review for "Magic: The Gathering – Rise of the Eldrazi"